Successfully Added Pulse Oximeter and Heart Rate Monitor to your Shopping Cart. This portable Pulse Oximeter and Heart Rate Monitor is a battery operated pulse oximeter that also displays your heart rate. IT measures the saturated level of oxygen in your blood using photoplethysmography, and measures your heart beat per minute by optically obtained plethysmograph which illuminates the skin and measures changes in light absorption. To use this Pulse Oximeter and Heart Rate Monitor, just insert your finger like the diagram indicated below*, then press the power button and the Pulse Oximeter and Heart Rate Monitor will display your heart beat p/m, the percentage of oxygen in your blood and also displays an LED indicator bar that increases and decreases by syncing with the rhythm of your heart beat. The bar graph serves the purpose of letting you know if you’ve got a weak or strong hear based on the level of the graph. You get all this without needing to go to the hospital, see a doctor or have any invasive procedure. 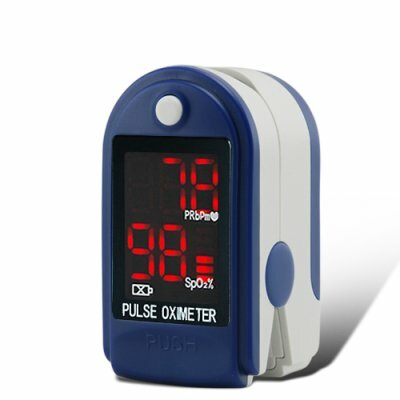 This Pulse Oximeter and Heart Rate Monitor is suitable for physicians, home doctors (mom), medical students, healthcare workers, athletes, pilots, community sports centers etc. Demand for a lightweight, inexpensive monitor for measuring SPO2 oxygen saturation and heart rate during physically active sports and high-altitude activities is in huge demand, so we present this Pulse Oximeter and Heart Rate Monitor at a wholesale price and directly available to B2C and B2B consumers. This Pulse Oximeter and Heart Rate Monitor is brought to you by the leaders in wholesale consumer electronics Chinavasion. Click "Add to Cart" now, and we'll express ship you a sample straight away, and within a few days, you'll be able to start seeing you hear rate p/m and measuring blood SPo2 levels. Accuracy: +/- 2% (70% - 99%), unspecified (<70%) for SPO2, +/- 2BPM or +/- 2% (select larger) for pulse ratio. A photoplethysmograph is an optically obtained plethysmograph, which is a volumetric measurement of an organ. This is often obtained by using a pulse oximeter which illuminates the skin and measures changes in light absorption and monitors the perfusion of blood to the dermis and subcutaneous tissue of the skin. (To learn more about the wonders and processes on how photoplethysmography work, please visit http://en.wikipedia.org/wiki/Photoplethysmograph. A pulse oximeter is a medical device that indirectly measures the oxygen saturation of a patient's blood (as opposed to measuring oxygen saturation directly through a blood sample) and changes in blood volume in the skin, producing a photoplethysmography. on 2010-10-17 18:12:47 Great price and it works. It works, it is about a fifth the price of anything equivalent I could buy elsewhere. I will be telling every doctor I know to get one at this price. It has it's quirks, it will give unreliable readings without warnings or errors, especially if the person is moving around or jerking a lot. However, if the patient sits still is it accurate. It did as well as the $1200 machine I have to use at work.